This video shows Free Syrian Army fighters preparing a grave to bury the body of a young Kurdish fighter, believed to be a member of the PYD, killed during a battle in a northern area of Aleppo, Syria. It is claimed in some reports that the PYD (Democratic Union Party) is affiliated with the Kurdish PKK in Turkey. The FSA accuses the PYD and PKK of collaborating with the government of Bashar al-Assad. 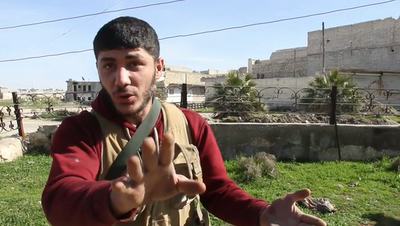 The contributor who shot the video says the FSA also claims the Kurdish militia group is using child soldiers. The Assad regime has in the past admitted to providing support to the PYD. Portrait of an old man among the refugees as he waits to cross the border from Greece to Macedonia. 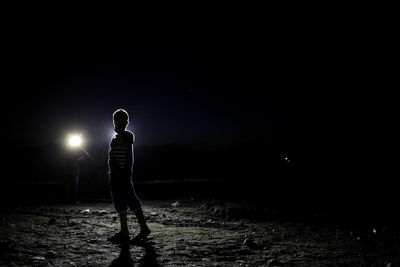 Idomeni, August 24, 2015. Refugees walk among the fields towards the Greek-Macedonian border. Idomeni, August 24, 2015. 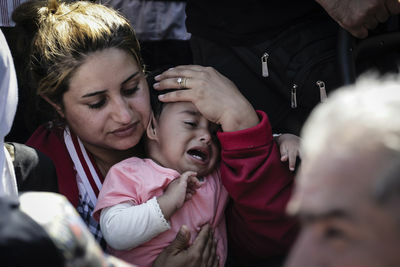 A small child cries because of the tension as refugees wait to cross the Greek-Macedonian border. Idomeni, August 24, 2015. Refugees wait to cross the Greek-Macedonian border. 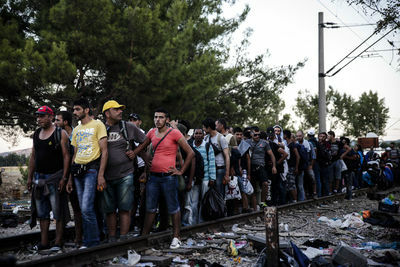 Idomeni, August 24, 2015. 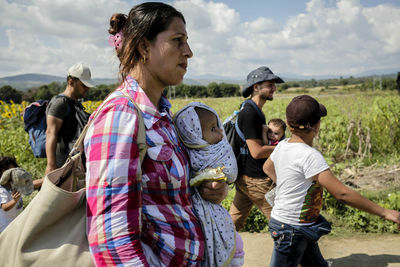 Refugees among the fields walk towards the Greek-Macedonian border. 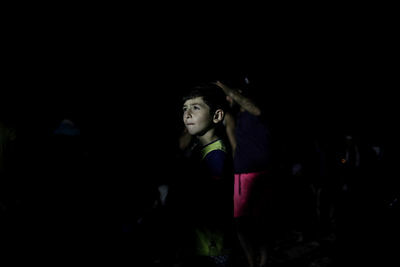 Idomeni, August 24, 2015. 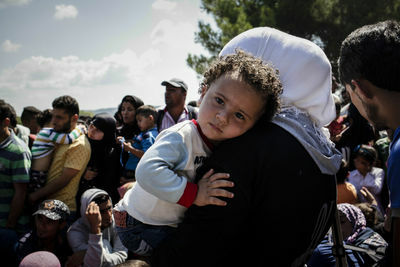 A small child on her mother's arms among a group of refugees waiting for the permission from the Macedonian border police to cross the Greek-Macedonian border. Idomeni, August 24, 2015. 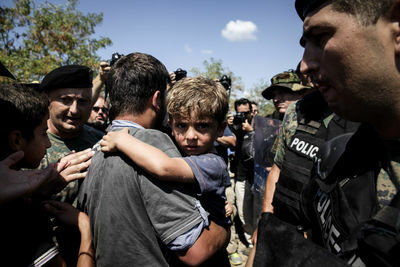 A small child on his father's arms and the Macedonian border police on the Greek-Macedonian border. 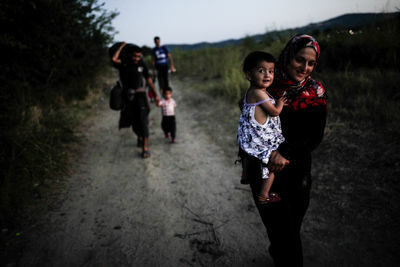 Idomeni, August 24, 2015. A small tension between refugees waiting to cross the Greek-Macedonian border and the Macedonian border police. Idomeni, August 24, 2015. 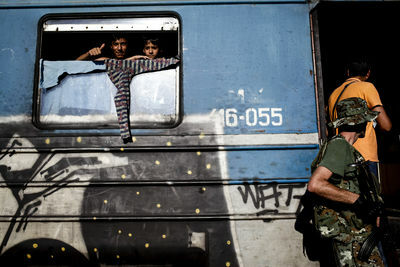 Refugees sit down on the train tracks as they wait to cross the Greek-Macedonian border. Idomeni, August 24, 2015. 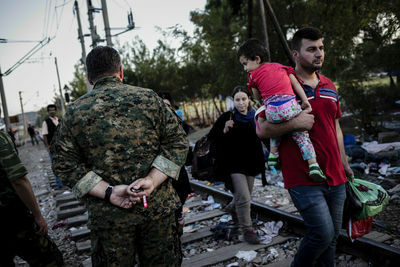 Refugees cross the border from Greece to Macedonia to board on trains that will take them to the Macedonian-Serbian border. Refugees wait to be transported by train to the Macedonian-Serbian border while the Macedonian border police is guarding them. Gevgelija, August 23, 2015. Refugees, among the children, are waiting in the line to board on the train that will take them to the Macedonian-Serbian border. Gevgelija, August 23, 2015. 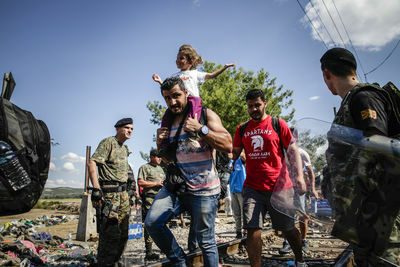 Refugees are crossing the Greek-Macedonian. Gevgelija, August 23, 2015. 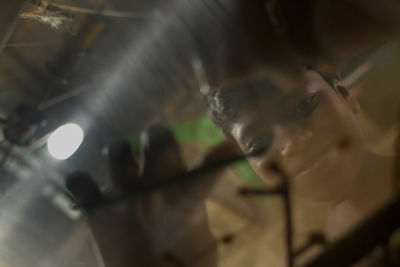 Refugees, among the children, in the train that will take them to the Macedonian-Serbian border. Gevgelija, August 23, 2015. 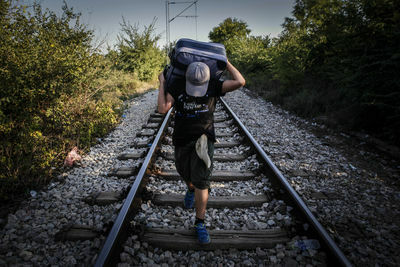 A refugee child carries his luggage as he walks on the train tracks to the Gevgelija bus station. Gevgelija, August 23, 2015. 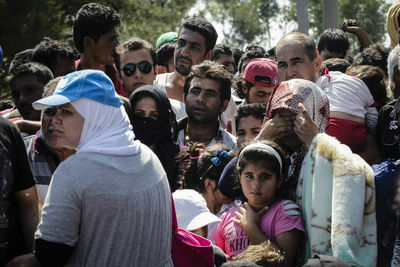 Refugees wait in the line to cross from the Greek side of the border to the Macedonian. 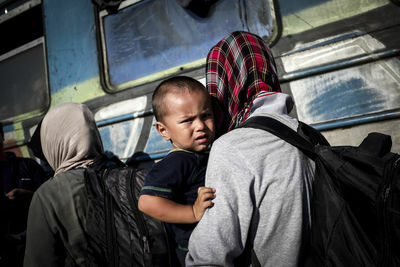 Idomeni, August 23, 2015. A refugee crosses the Greek-Macedonian border. 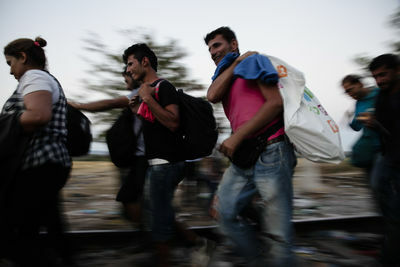 Idomeni, August 23, 2015. 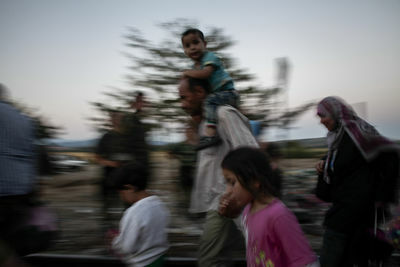 Refugees cross the Greek-Macedonian border from Idomeni to Gevgelija on August 23, 2015. 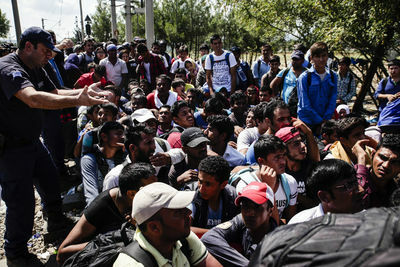 Refugees after crossing the Greek-Macedonian border walk towards the train that will take them to the Macedonian-Serbian border. Gevgelija, August 23, 2015. 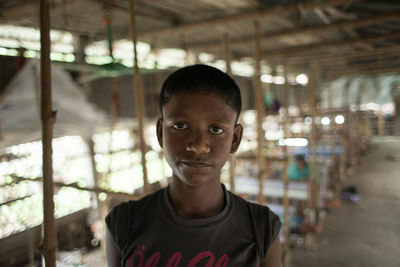 Portrait of a refugee child waiting for the train that will take him to the Macedonian-Serbian border. Gevgelija, August 23, 2015. A refugee child waiting for the train that will take him to the Macedonian-Serbian border. Gevgelija, August 23, 2015. 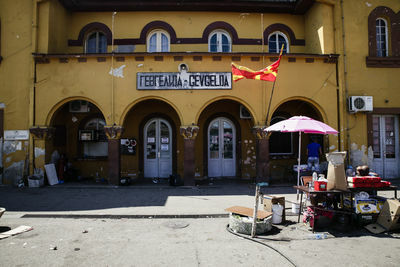 The Gevgelija train station. Gevgelija, August 23, 2015.